The unmistakable Sperm whale cruises deep waters in all the world's oceans. 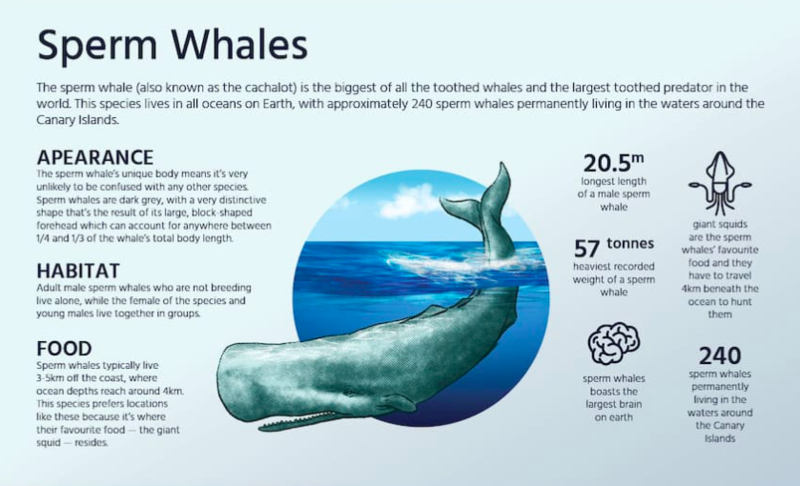 Swimming in schools of 20 to 25 individuals (mostly females and their young), these whales are commonly found in submarine trenches at the edge of the continental shelf but may occur inshore where water is deeper than 600 feet. Typically, only the bulls (adult males) are found in the Antarctic where they migrate in the summer to feed. Although the Sperm whale is easily identified it rarely shows much of its body above the water. The largest of the Antarctic toothed cetaceans, Sperm whales have an enormous square head and a robust dark grey or brownish grey body with corrugations in the skin giving it a shrivelled prune-like appearance. The narrow lower jaw is filled with 20-25 large conical teeth (which fit into sockets in the upper jaw). Sperm whales have no dorsal fin but two-thirds of the way down the back there is a marked dorsal hump, followed by a series of distinctive knuckles reaching to the broad, triangular and deeply notched tail flukes. Sperm Whales feed on squid, fish and octopuses caught on amazingly deep ocean dives. When feeding, they consume about one ton of food each day. Like other toothed whales, the Sperm Whale uses echolocation as a means of navigation and identifying prey. By emitting a series of high-pitched clicks and sensing them as they bounce back, the whales are able to tell what is around them. This is crucial in hunting giant squid some which reach 500 pounds and are found in absolute darkness at depths of nearly 4000 or 5000 feet.